Built-in Camera:Updated latest version with camera function bring more fun,You could take a photo with APP launch, no need to do any operation by kids,in the case of don't disturb children, watch will automatically to the child's environment photograph, help you understand the safety of the surrounding environment. 2. Saving telephone numbers in the SeTracker App setting's telephone, kids can answer and receive calls, but when saving in the contacts, kids can only receive calls, can't make calls! 2018 NEW EDITION KIDS WATCH:GBD kids smart watch built-in quick learning game,Double position (GPS + LBS) technology based on AGPS, Local Base Station means double safety for kids.Achieving all day real-tim location tracking and help parents keep an eye on your kids' safety. Soft silicone wristband and very gently for children's skin. REMOTE MONITORING:Parents can set the voice monitor number in mobile phone App, dail the number, the watch will automatically answer without remind. So the parents can hear the children and will not disturb kids' happy time.Through the APP, parents can monitor the child's location in real time, Help you make sure the children safety! 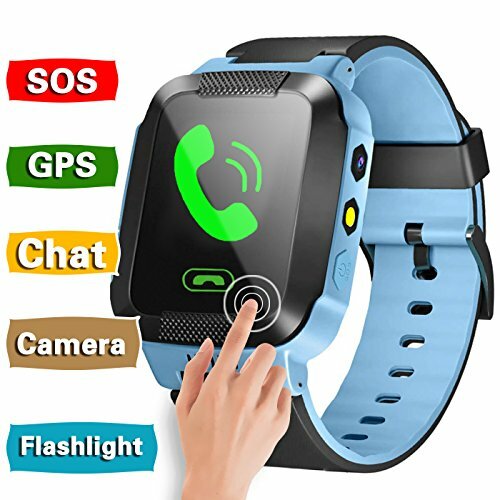 SOS EMERGENCY CALL FEATURE:Kids can press watch SOS key for 3 seconds in any model. Parents can setting three numbers for SOS emergency call, it will call 3 SOS phone numbers alternatively in 2 rounds until answering the call.Thanks to an intuitive SOS feature,this is so important in an emergency situation. SAFETY FENCE:Parents can customize security range on Phone APP and control the kids tracker watch, when the child beyond the safety zone, the APP will receive the reminder immediately (The minimum radius of the safety area is 1640ft) so parents can call kids watch to confirm if they are in safety situration! Good helper for parents!  CUSTOMER SERVICE:We hope every customer will be happy to purchase in our store,we provide 100% satisfaction guarantee,free return within 90 days with product quality,life time warranty,if you have any problem with the watch,just feel free to contact us by your order email and we will try our best to help solve your issue. If you have any questions about this product by GBD, contact us by completing and submitting the form below. If you are looking for a specif part number, please include it with your message.